Ankle pain can hobble you, forcing you out of your favorite sport. Talk to the ankle pain experts at the Sports Injury and Pain Institute of NY about your options, including a steroid injection for ankle pain. 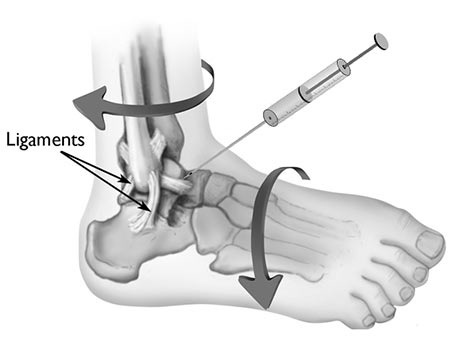 A steroid injection ankle feels less pain and is less inflamed. It’s safe, too; most cortisone injection in ankle side effects are minor and temporary. The latest healing technique is a platelet-rich plasma or PRP ankle injection, which works to heal your condition from the inside out. Your ankles and knees are the joints that have to carry your weight, whether you’re walking, running, jumping or playing your favorite sport. Ankle pain and knee pain, therefore, are conditions to take seriously. Since your ankles are so much smaller and more flexible than your knees, they’re more prone to injuries. Protect them! But when you’re experiencing ankle pain, seek out your doctor in New York City. Depending on the reason for your pain, your treatment alternatives vary from rest and ice to platelet-rich plasma or PRP ankle injections. And while surgery is an option for extreme cases, a steroid injection for ankle pain can set you on the path to regaining your step. All these conditions cause ankle pain. Some cause painful inflammation. Your steroid injection for ankle pain leads to less inflammation, which means less pain. It not only eases the pain you’re experiencing, but it also helps your ankle heal — because when you’re not fighting pain all the time, your body can concentrate on getting better. The first step is to get an accurate diagnosis. Your sports medicine and pain management doctor in Midtown Manhattan gives you a physical exam to determine the exact cause of your pain. If needed, you undergo x-rays or an MRI, but often your doctor can diagnose your condition without them. The first treatment options are often rest, alternating hot and cold, compression and elevation. You can take over-the-counter non-steroidal anti-inflammatories for the pain and swelling. If these at-home remedies don’t produce the desired results, a steroid injection for ankle pain may be the next step. You’re made comfortable, perhaps with your ankle on an x-ray table, with the injection spot on top. Your doctor may need to use the x-ray machine to get real-time fluoroscopic images of your ankle. He uses those images to guide the needle. When the needle is in place, the physician injects the medicine right where it’s needed, right where you feel the pain. Your doctor may have to put the medicine in multiple places, which surrounds and coats the problem area. Once the last injection is made, you can relax while you recover under observation for a short time to see how the medication worked. If successful, you should feel an immediate reduction in pain. The injection contains a small amount of local anesthetic, which acts right away. But when it wears off in several hours, your pain may return. That’s normal. The steroid medication needs a couple days to really start working. In the meantime, your doctor may give you some pain medication to get you through the first few days after your injection. It’s also possible that the cortisone crystalizes in the joint, which is why your doctor limits the number of steroid injections you can get in a given time period. You can get them no more than once every six weeks and no more than three injections a year. A platelet-rich plasma or PRP ankle injection puts treated, concentrated platelets in your ankle to heal it from within. Platelets are normally known for their ability to coagulate your blood and stop bleeding. But they’ve been shown to have healing properties too. Stem cell therapy, which uses stem cells taken from your own bone marrow, also shows remarkable healing properties. In this two-part treatment, your stem cells are harvested and concentrated. Then they’re injected into your painful ankle. Do you have any questions about the ankle injection to relieve ankle pain in NYC? 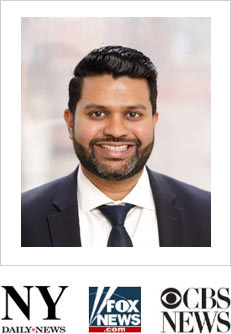 Would you like to schedule an appointment with the best rated ankle pain doctor Febin Melepura MD of sports pain clinic in NYC? Please contact our office for consultation with the top pain relief specialist in Midtown Manhattan.